Scott began his performance career at age 15, and has studied at Interlochen, EGRHS, GRCC and GVSU. Scott has performed before presidents Bush, Reagan, Ford, PM Margaret Thatcher, Queen Beatrix (NDL), and has worked on projects that have included Martin Short, Kevin Nealon, Alan Zweibel (SNL), Jay Leno, and Tony Randall. 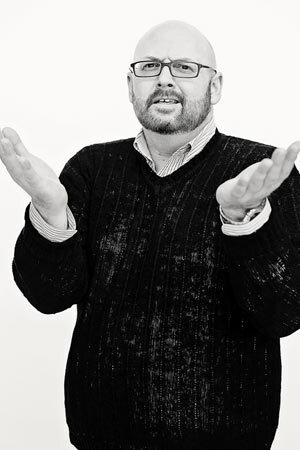 Scott has produced work for Grand Rapids Civic Theatre, Actor’s Theatre, Heritage Theatre Group, GVSU, Aquinas College, Circle Theatre, Jewish Theatre Grand Rapids, and West Michigan Jazz Society. Scott’s repertoire of work includes: Fun Home, Shrek Jr., If/Then, Seussical The Musical, It Shoulda Been You, The Addams Family, American Idiot, Rock Of Ages (Grand Award), First Date, CATS, Dogfight, Heathers, Evita, Chess, Spamalot, Bloody Bloody Andrew Jackson, The Wedding Singer, Chicago, Next To Normal, Spring Awakening, Honk!, Little Shop Of Horrors (Grand Award), Reefer Madness, Rent, Altar Boyz, Hello Muddah, Esther, Smokey Joes Café (Grand Award), Love,Perfect,Change, Pippen, andAin’t Misbehavin’. He has also written and directed several original and concert version shows, including Let’s Twist Again, Shout Somebody, A Bit Of Billie, Let It Be, Jesus Christ Superstar In Concert, Men Of Motown, Divas Of Soul, and The Music Of: Queen, Woodstock, Stephen Schwartz, andAndrew Lloyd Webber in Concert.As a freelance vocal talent, Scott’s voice has been heard in many regional jingles and ads over the years. He has been a returning guest artist at Fountain Street Church and St. Thomas the Apostle as well as many other charitable organizations. He has performed in venues throughout the USA, and continues to provide public and corporate entertainment. Scott’s favorite thing about teaching at Civic, is getting to see his students grow. Watching a student discover what is inside of them, process and develop skills, and then strengthen themselves to create confidence. To be there when somebody’s life changes in so many positive ways…it is truly one of the best things in life. I am inspired by cultural exchanges, be they musical, culinary, visual, or just listening to someone tell a story. The idea that we all innately share the same DNA, but vary in groups as cultures…and even more as individual artists, is remarkable to me. The Vampire Lestat. I love reading historical fiction. When I was in college, I discovered Anne Rice’s vampire chronicles. I was hooked. The idea that one could live through centuries of history, meeting Beethoven, Mozart, Napoleon, or watching the first movie, first flight, seeing eras of human development…that’s so cool to me! Yes, when I grow up…I think I want to be a vampire. Pudding cup, in a little can. Both of my parents worked, when my brother and I were kids. The best score, was finding one of these little gems in your lunch, or finishing the last one, as your brother watched in absolute anguish. As an adult, one of my favorite desserts is Creme Brulee..which kind of is still pudding if you think about it.